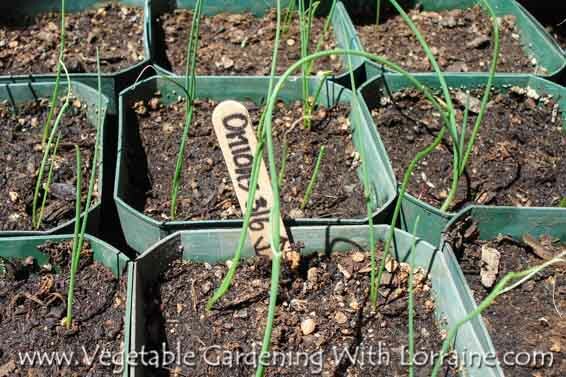 Growing onions from seed has several advantages over growing onions from “onions sets” or “onion transplants”. Starting onions from seed offers gardeners the widest choice of varieties, but in the north this means starting your onion seeds indoors about 10 weeks before your last frost date, under bright fluorescent lights. Onions grow their big green tops early in the season, and then when the days start to get longer and warmer, they switch from growing green tops to developing onion bulbs. The more green growth they put on before the days get warm, the bigger the bulbs will be later. So start growing onions from seed indoors, but plant them out about 4-6 weeks before last frost. If you’re farther south and have a long enough growing season, you can direct-seed onions in the garden. Plant onion seeds only about ½” deep. This will make it easier for the onions to form bulbs, because they won’t have to push so much dirt away. You’ll also be able to watch the bulbs forming, which is kind of fun! It’s normal for an onion to form about 2/3 of its bulb above ground. Plant onion seeds about 4” apart from each other. If you want to eat some as green onions when they are little, plant them closer than that, and then thin them to 4” apart later, eating the thinnings. These are bunches of partially dried baby onions, maybe ½” thick or so, started last year and sold in little bundles at nurseries. They give you a good jump on the growing season, but don’t usually offer much choice in terms of variety. They may also be more likely to bolt on you, because they may be seasonally confused (onions naturally want to go to seed in their second year). But at least you won’t need a seed-starting setup in the house! Plant them out 4-6 weeks before last frost. Don’t soak them first or you’ll encourage disease, just put them in the ground and then water. These are similar to onion sets, only they were grown this season. They give you the best jump on the season, but again, you won’t get much choice of varieties. Plant out 4-6 weeks before last frost. General cultivation advice for soil and growing conditions, the difference between long-day and short-day onions, and how to keep 'em happy. Whether from seeds, sets, or transplants, how to sow onions so they are the correct final depth. How to prevent onion bolting, and what to do if your onion do start to go to seed. Descriptions of the most common diseases affecting onions, and how to prevent them from getting started in the first place. How to harvest onions without damaging them. Best ways to store onions over the winter, including hanging, braiding and use of orchard racks. Whether chef or gardener, the type of onion you grow or eat can make a huge difference to your success.